The Tantramar region is located on the upper section of the Bay of Fundy, a body of water that experiences the highest tides in the world. The region is buffered by salt marshes and a system of dykes which protect against regular flooding; however, coastal flooding still occurs during storm surges (which can be further intensified during high tides). Over the past 25 years, the frequency of storm surges on the Bay of Fundy has tripled and the height of sea level has risen (Lieske and Bornemann, 2011). As climate change progresses, its effects are projected to contribute to the further rising of sea levels and frequency of intense storms. According to R.J. Daigle Enviro’s 2011 report, what was considered a 1 in 100 year storm in 2000 will be a 1 in 25 year storm by 2025. What will be considered a 1 in 100 year storm in 2025 will be a 1 in 10 year storm by 2050. The existing dyke system will not adequately protect against the projected sea levels during these storms, meaning that in the near future the Tantramar region will begin to experience even more frequent flooding and intense coastal erosion. Given these circumstances, the residents of Tantramar must learn how to prepare for and adapt to climate change. The Regional Adaptation Collaborative (RAC)/Atlantic Climate Adaptation Solutions Association (ACASA) is already funding research about the many impacts of climate change on Tantramar; a Mount Allison University course that will educate the public about the need for regional adaptation to climate change; and efforts to coordinate community discussions and plan for Tantramar’s future in a world with changing climate. To learn more about each of these initiatives, please visit their individual pages. David J. Lieske and James Bornemann (2011). 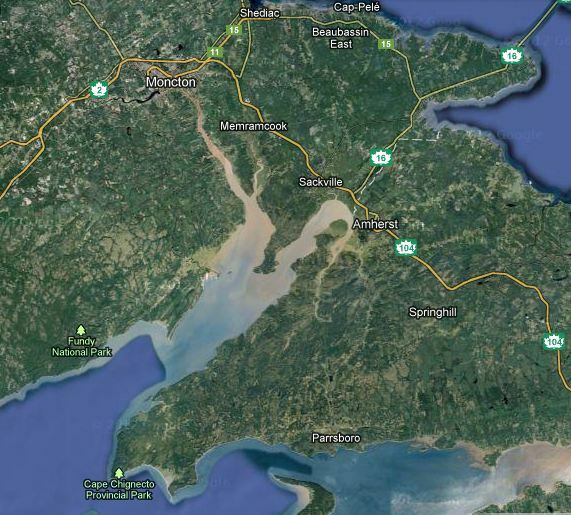 Coastal Dykelands in the Tantramar Area: Impacts of Climate Change on Dyke Erosion and Flood Risk. A report for the Atlantic Climate Adaptation Solutions Association. R.J. Daigle Enviro (2011). Sea‐level rise estimates for New Brunswick municipalities: Saint John, Sackville, Richibucto, Shippagan, Caraquet, Le Goulet. A report for the Atlantic Climate Adaptation Solutions Association.